Santee’s Kiwanis Club has a longstanding dedication to honoring excellence in local law enforcement officers who protect and serve East County. This special recognition has continued annually for 20 years. The latest awards ceremony for 2017 was conducted on May 27, with a social hour, dinner and election of new Kiwanis officers preceding announcement and presentation of this year’s awards. The festive and fun event was held at the Lantern Crest Senior Living facility. Club President Joe Gersztyn called the meeting to order, informing attendees that he was retiring from service as president, prior to nominations and voting for next year’s club officers 2017-2018. David Poindexter is a longtime Santee Kiwanis member, who has served as Chairman of the club’s Law Enforcement Awards Program for all 20 years of its existence. He is himself a former Sheriffs’ Senior Volunteer and former Sheriffs’ Homicide Volunteer. Poindexter opened the formal presentation portion of the day’s events. The over two decades of history behind this awards ceremony is itself unique. The influence of Poindexter’s Uncle Andy McReynolds (1919-1996) was central in encouraging the Santee Kiwanis Club to recognize those who defend the laws and protect local communities. McReynolds was very active with the Kiwanis Club of Santee, spending most of the last decade of his life in Santee. McReynolds was a Kumeyaay Indian, the first motorcycle officer with the El Cajon Police Department in the 1940’s. The department at that time had four officers. McReynolds later volunteered for the CHP, with a special focus on helping the Kumeyaay Indian reservation. The law enforcement awards program was started in 1998, with McReynolds in mind as inspiration for the Uncle Andy McReynolds Memorial plaque. “He never stopped giving back to his community,” Poindexter said. The Andy McReynolds Memorial plaque is given to honor a California Highway Patrol Senior Volunteer. 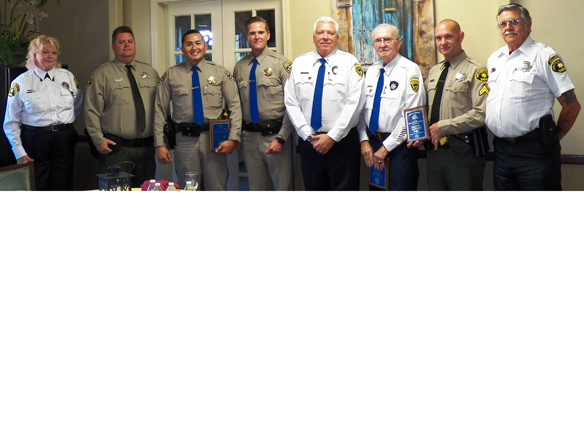 The Kiwanis Law Enforcement Awards Committee decided in 2000 to add another award, acknowledging a Santee Sheriffs’ Senior Volunteer. This award was included in recognition of Max McKinley, an actively involved Santee Kiwanis member who passed away in 2000. McKinley was also active in service to the United Methodist Church. He and his wife were foster parents for 19 children. He became known fondly for his fairness, kindness and compassion toward those he dealt with, even when issuing tickets and citations. Those who have followed in his footsteps say that he “helped set the standards for Senior Volunteers” in performing their public contact duties. In 2001, the Santee Kiwanis began honoring a Deputy Sheriff from the Santee Station for distinction. Next, in 2006, the club extended recognition for excellence awarded to an El Cajon CHP officer. In 2010, Santee Kiwanis started honoring a Santee Sheriff’s Community Service Officer. And then, in 2015, longtime member Bob Taylor passed away. Taylor was another exemplary Santee Kiwanis member who was also very engaged as a law enforcement volunteer. Bob Taylor was a 41-year member of the club, a longtime Sheriffs’ Senior Volunteer with the Santee Sheriffs’ Department, who had assisted Poindexter with the inception of the club’s law enforcement program. Santee Kiwanis decided to add his name to the award bestowed to a Santee Sheriffs’ Senior Volunteer, now known as the Max McKinley and Bob Taylor Memorial plaque. Taylor became closely involved with the Sheriffs’ Volunteers starting in 1994. He resigned shortly before he passed away. He helped with standing up the Sheriffs’ Volunteer Academy, where he was an instructor in radio communications. In 1997, he started the homicide response program to support detectives at homicide crime locations. The CHP officer from El Cajon who presented awards at the ceremony was Sgt. Robert Gessner. He first called forward CHP Officer Clayton Alvarez to be honored. Alvarez has been with the CHP for seven years. “He has an excellent work ethic and serves the community with dedication. He demonstrates true leadership by example and delivers the highest level of service,” Gessner said of Alvarez. The Uncle Andy McReynolds Memorial Volunteer of the Year Award recipient was Robert Donohue, who was noted for distinction as being “among the best of our CHP senior volunteers.” Donohue served in the Navy, re-enlisted and worked in multiple assignments, including three tours with the Marine Corps. He worked in hospital administration before retiring in 1988. Captain Hank Turner is new Commander with the Santee Sheriffs’ Station, on the job for six weeks. Turner presented the award honoring Sheriffs’ Deputy Jerold Ring. “Jerry Ring worked on shutting down drug dealing,” Turner explained. For the operation called “Easy Pickin’s” Ring set up fictitious drug user accounts and visited dark websites for supposed online drug buying. A total of 10 drug dealers were arrested. “But there are lots of crimes involved, not just drug dealing,” Turner went on. The operation was 4 months in planning, four weeks in operation. Honoree for The Max McKinley and Bob Taylor Memorial Volunteer of the Year Award was presented to Sheriff’s Senior Volunteer Don Stokes. Sheriff’s Community Service Officer Daniel Bumbar was unable to attend the ceremony and accept his award. Turner agreed to present the award to Bumbar later. The Santee Kiwanis group consists of business professionals united for networking and service in local communities, in a spirit of fun and camaraderie. The Santee Kiwanis Club meets at Lantern Crest Senior Living in Santee, gathering there for breakfast at 8 a.m. on the second and fourth Tuesday of each month. More information on the Santee club can be found on its website at santeekiwanis.org.